Stokes Nature Center relies on volunteers to help carry out our mission to provide nature education to people of all ages. SNC’s volunteer program offers an opportunity for meaningful community service. As a volunteer, you can learn from experienced naturalists, develop new skills, and enjoy meaningful experiences. More established volunteers, such as retired teachers or professionals, make exceptional Nature Center Docents and Naturalist Educators, sharing their wealth of knowledge and insights with the next generation. Before you are able to jump into volunteering with SNC we ask that you join us for a brief volunteer orientation in order to introduce you to Stokes as an organization, our staff, our programs, the community we serve, volunteer benefits, as well as other volunteers. The orientation will take about 30 mins. Completing a volunteer orientation is required before you begin volunteering. SNC hosts a variety of special events throughout the year, aimed at raising funds and engaging the community. These events are all-hands-on-deck for our small staff, and we always need assistance with decorations, marketing, handing out flyers and hanging posters, and setting up and running the event! If you’re looking for a creative, short-term opportunity to volunteer, this would be a great fit. Does hanging out at a beautiful nature center, listening to the Logan River, and chatting with friendly visitors sound like the right fit for you? SNC is always looking for mature, trustworthy volunteers to serve as docents. Sign up for a half or full day – whatever works for your schedule. You’ll hand out brochures on trails and recreation, give advice about what animals to watch for, and sell the occasional t-shirt! We welcome volunteer instructors to help assist or lead programs for a number of age groups! Whether you’re most interested in working with kids or adults, we have a full year-round educational program schedule that could use your help. 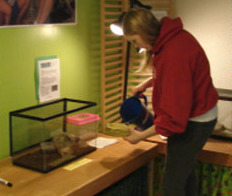 Want to get up close and personal with our Nature Center Critters? Stokes is always looking for volunteers who can commit to coming in on their own time to help us care for our collection of native critters. Change aquarium water for "Flash" the turtle, feed "Gonzo" the snake, spritz down "Andy" the amphibious salamander, and feed our local Hummingbirds! Group service project vary depending on the group size. Contact us to see how your group can volunteer at SNC today! We regularly work with Scouts on their capstone projects. Please note, we do require the scout to take the leadership role in planning the project, recruiting and overseeing volunteers, and executing all stages of the project. However, we’ll work to provide necessary support, and assist scouts in determining meaningful projects that will benefit Stokes Nature Center long after the project is completed. Our Nature Center is getting older and it needs some loving care! If you are a handy individual who wants to give back to your community, please consider volunteering as a regular maintenance volunteer! Typical Needs include: changing light bulbs, installing shelves, constructing exhibits with education team, changing air filter, general building upkeep, etc.